Tourists visiting Stratford upon Avon could be forgiven for thinking that perhaps 'Shakespeare upon Avon' would be a more appropriate name for this charming town, since it has such strong links to the world's most famous Elizabethan playwright and bard, William Shakespeare. It was actually in Stratford upon Avon where Shakespeare was born some 450 years ago, and his birthplace has now become a must-visit tourist attraction. Stratford upon Avon is first and foremost a market town and is fortunate to have preserved many of its extremely historic buildings, which add a tremendous period character to the streets. Tourism is now big business in the town, with tourists arriving by the coach load in the summer, all keen to search out information about Shakespeare and where he grew up and wrote some of his plays. 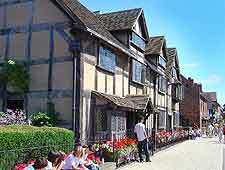 When it comes to tourist attractions in Stratford upon Avon, many are related to Shakespeare, or of a historic nature. 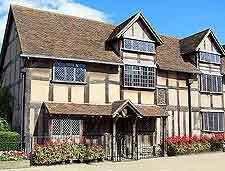 The local Shakespeare's Birthplace Trust owns and manages no less than five different properties in the Stratford upon Avon area, all of which have strong connections to the great bard himself. One of these is Anne Hathaway's Cottage, where the wife William Shakespeare spent her childhood. 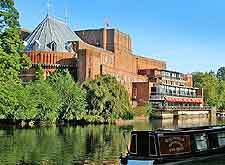 Each year many tourists head to Stratford to take in a performance at the Royal Shakespeare Theatre, while others will enjoy a boat trip along the River Avon, an afternoon picnic at the Bancroft Gardens, a visit to the tropical Butterfly Farm, or spend time at the museum-like Falstaff Experience. The County Raceway and the Stratford upon Avon Racecourse also both warrant a strong mention. More information about Stratford upon Avon Tourist Attractions. History is an integral part of the town and the row of 15th-century Almshouses is a particularly impressive site, as is the Guild Chapel, the Holy Trinity Church, and the Harvard House, which is known for its black and white Elizabethan facade. The Stratford Town Hall is another important landmark and boasts many appealing features, including a statue of William Shakespeare. Of particular interest to Shakespeare buffs is Hall's Croft, a family home to Shakespeare's daughter Susanna and her husband Dr. John Hall. As you stroll around the town centre, the American Fountain is another site that is hard to miss and is especially ornate. More information about Stratford upon Avon Landmarks and Monuments. Museums are almost commonplace in Stratford upon Avon and tourists should be sure to pencil in a visit to Nash's House and New Place on Chapel Street, which was once the home of Shakespeare's granddaughter's first husband and was actually built on the former house of William Shakespeare. Very much another must-see is the 'Olde World' Shakespeare's Birthplace on Bridge Street, where in 1564, the acclaimed playwright came into the world. Children will always enjoy the information and activities on offer at the Stratford Brass Rubbing Centre. If you have time, then head to the neighbouring village of Wilmcote (believed to be the setting of the Shakespeare play - The Taming of the Shrew) and explore its leading attraction of Mary Arden's House, which also goes by the name of the Shakespeare Countryside Museum. 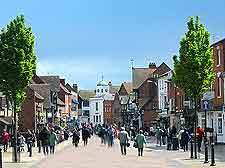 There are also a number of reliable art galleries in Stratford upon Avon and its surrounding towns, such as Leamington Spa. 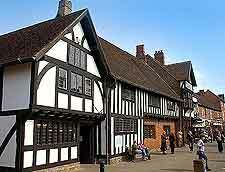 More information about Stratford upon Avon Museums and Stratford upon Avon Art Galleries. All around Stratford upon Avon and Warwickshire are a series of nearby attractions, offering tourists the possibility of many alluring day trips. The lively town of Banbury is around 45 minutes away and is famed for its tasty Banbury Cakes and more besides. Also close by is the bustling city of Birmingham, the Regency spa town of Cheltenham, the county capital of Gloucester, and the university cities of both Oxford and Warwick. 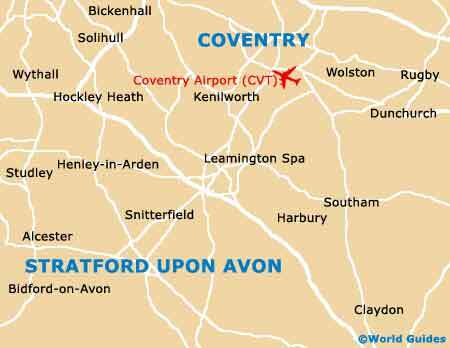 Also close to Stratford upon Avon is Coventry and its extensive selection of shops, the seasonal events of Nuneaton, and the varied attractions and museums of Leicester - including the National Space Centre. More information about Stratford upon Avon Attractions Nearby.